The Acehnese Godown at Acheen Street (Lebuh Acheh) in Penang is one of the lesser promoted and lesser known building within the Georgetown Core Heritage Zone. The lackluster popularity of this building towards the southern end of the Core Heritage Zone could be due to several reasons. Firstly, it is a non-descript building, apart from its height that is an anomaly when compared to its immediate neighbours. Secondly, there are more stately buildings that lie to its west along Acheen Street, namely the Acheen Street Mosque, as well as several others at Cannon Square and Armenian Street. 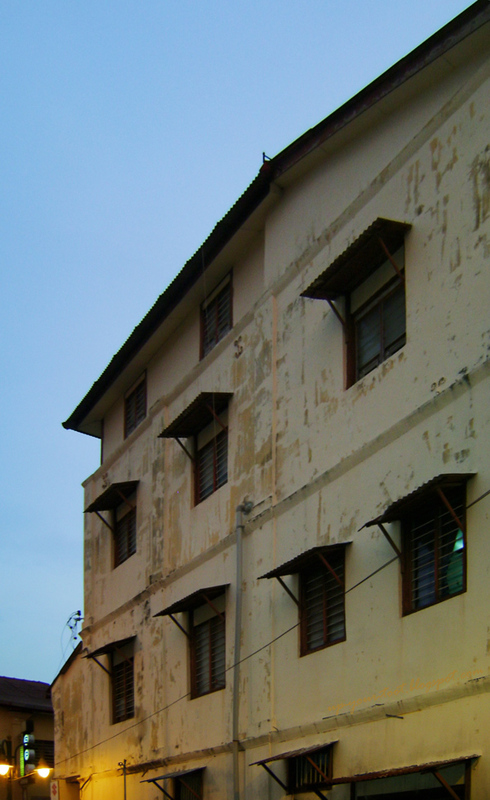 View of the Acehnese Godown (高楼仔 - the four-storey building with many side windows) from across Beach Street. Notice that the rest of the buildings in that area are only two-storey high. Where I was standing would have been the beach, or the sea when the building was first built. Photo taken on the 23rd of June 2012 during the George Town Festival. 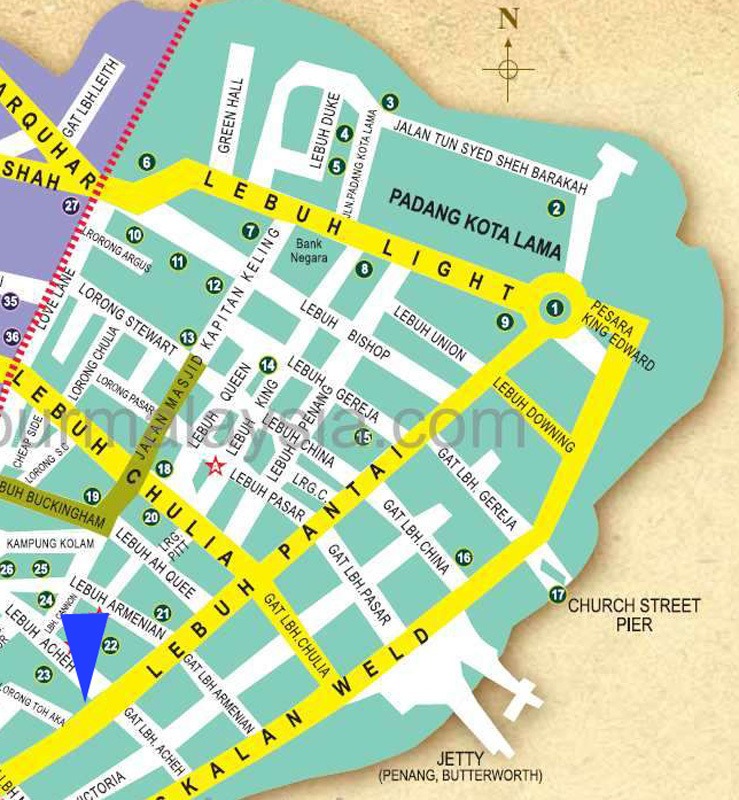 Lastly, people tend to do tours of Acheen Street starting from Carnavon Street or from Armenian Street, then down Cannon Street past Cannon Square, thus by the time they reach the junction of Acheen Street with Beach Street (Lebuh Pantai), there is nothing much to see (more like too hot, sweating like mad, legs hurt etc. etc. etc.). View of the windows at the side of the Acehnese Godown. Note the small windows on the ground floor of this building that looks like prison windows. 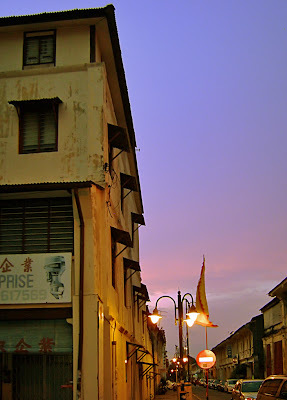 Photo taken from Acheen Street looking out towards the junction of Beach Street and Acheen Street, Penang. Sad indeed, as one of the old Hokkien name for Acheen Street is Kuan Lau Ah (高楼仔, also given as 悬楼仔), literally Tall Building (i.e. the tall building junction), referring to this four-storeyed building located at the beginning of the street. This building, which is actually one of the oldest buildings along Beach Street, is also tallest building in that street throughout the 19th century, and was already marked in the 1803 Plan of Georgetown (Leith Map 1803). 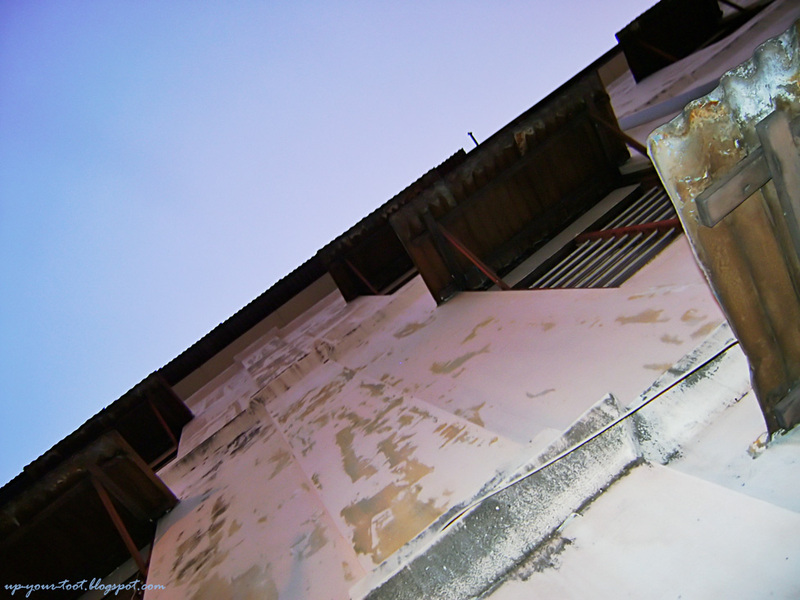 Originally the building was acquired by the East India Company as a jail, it was later renovated into a godown with a shophouse added to the front by Tengku Syed Hussain al-Aidid, the Acehnese clan leader/trader who moved his trading base to Penang at the invitation of Captain Francis Light; who did so to boost the popularity of Penang as a trading post to rival that of Acheh. 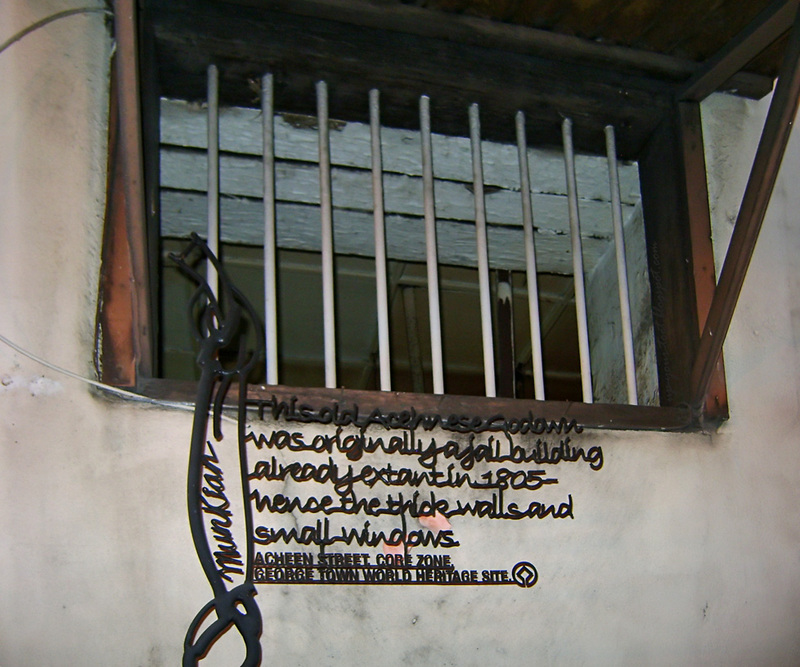 A metal filigree sign, which is part of the 'Escape Sculpture' placed just outside a small window of the building says "This Acehnese Godown was originally a jail building already extant in 1805 - hence the thick walls and small windows". This sculpture is designed to look like a rope tied to one of the bars one of the small windows, as if someone is trying to escape from prison. In the past, Beach Street was a waterfront street, and where Acheen Street Ghaut stood today are the steps (ghat - from Hindi घाट) leading to the sea. Hence the location of this four-storeyed building is ideal as a godown for goods being traded by sea. Later, land reclamation extended the coast farther out, thus creating Acheen Street Ghaut and the perpendicular Victoria Street and later, Weld Quay. The current address for this building is 322 Beach Street, 10300 Penang; being the address for Li Lai Enterprise that sells outboard engines (The signboard indicates they carry Suzuki brand outboard engines). So if you are around the area, go by and take a look at this old, historical and err, rather non-descript (almost ugly, but what more can be said for a building that was a jail and a godown) four-storey building that started as a jail, then a famous merchant’s spice godown and is now partly a shop that sells outboard engines. This place is full of history, a great venue for shutterbugs to capture the beauty of old buildings. Oh yes this is indeed the place. When I was there for the Georgetown Festival, I think you can literally see all the brands of DSLR and compact cameras there, plus the number of people using their ipads and what nots to take pictures.